Blurb From Goodreads: Every morning, Melanie waits in her cell to be collected for class. When they come for her, Sergeant Parks keeps his gun pointing at her while two of his people strap her into the wheelchair. She thinks they don’t like her. She jokes that she won’t bite, but they don’t laugh. Why Read: Not that one really needs a reason to read a zombie thriller about children… but if I did have to explain myself, I’d probably point directly to the internet. I’ve been eyeing this particular read for quite a while, although my usual picks are more backlist oriented. By chance, it also seemed like the perfect type of audio book to get back into listening to Audible. Luckily, I was not wrong. 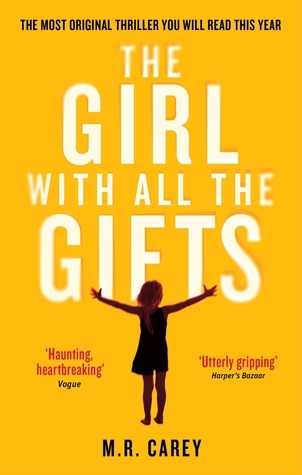 Review: If I had to choose a phrase to describe the whole of ‘Girl With All The Gifts’, it would be “entirely too disturbing”. Perhaps it was the childish voice that narrated the main character, Melanie, or maybe it was just the concept of zombies that somehow lie dormant like a virus? Who can say. But damn – this book was crazy creepy. I would be lying if I said I hadn’t exclaimed out loud in the car and yelled out, “No Melanie, DON’T!” Normally I reserve these kinds of books for actual paperback reading since your imagination can legitimately drive any reader insane (Yes Stephen King, I’m looking at you). But I had been so out of the whole audio-book vibe lately, that I thought I needed something that would hold my attention. I wasn’t wrong. The plot itself, I’m glad to say, isn’t a normal run-and-kill-everything zombie book that we’re all used to reading. For me, at least, it painted some humans…who will remain unnamed… as these horrible and terrible beings who have no sympathy or heart for children. As the story progresses, it becomes more and more clear why they act this way – and I suppose they should become likable. In some senses they do. Carey does a fantastic job of describing the motivations of all the characters through this changing point-of-view device that keeps you on your toes. Character-wise, there’s Melanie: Smart and Sweet Little Girl/Terrifying Zombie. She’s probably the character who receives the most narration throughout the book- and even though she’s young, her thoughts are spot on without sounding too “grown-up” for a child. Miss Justineau is probably my second favorite character, and by far my favorite description-wise. There is one scene in the book where Melanie is describing how much she loves Miss Justineau as a teacher and how beautiful she is. Perhaps it was because it was on audiobook and there was no warning, but as Melanie describes Miss Justineau, I almost cried in relief that there was a strong female black lead character. I mean: Rarity (in all seriousness). And you know what – she’s fantastic. Miss Justineau is perhaps the strongest character in the whole book and listening to her point of view, I will always imagine her as the main heroine. I want to give more information about the book, but it’s difficult to explain all the facets of why this is such an incredible book without giving secrets away to you unsuspecting future readers. So take my word (please) when I say this truly is a fantastic book and unless you’re buying it right now, you’re missing out.